Now bride Matrona you stand before the Bridegroom. 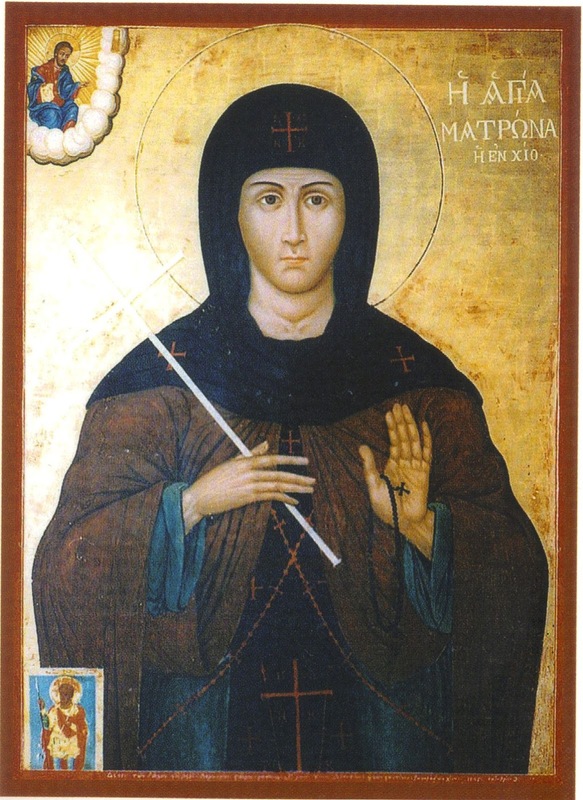 Saint Matrona was born with the name Maria in the village of Volissos in Chios sometime in the thirteenth or fourteenth century. Her parents, Leon and Anna, were pious towards God, devout in character, highly respected by all and wealthy. Maria was the youngest of seven children. From her youth, she showed to have much knowledge and love for God, causing her to despise all transitory pleasures and attachments to the world. When the time came for her parents to arrange her marriage, she refused because she wanted to remain a virgin. To avoid this marriage, she left Volissos and went to an area overlooking the village, called Katavasis. Here she began her spiritual struggle by fasting and prayer. Soon other nuns joined her. Her parents searched everywhere to find her. After locating her, they convinced her to return home. Maria complied with her parents' wishes, except for one — she refused to wed. Her parents, seeing that she still desired to lead a monastic life, gave her their consent to pursue her ambition. When Maria's parents died, she distributed the farmland she inherited among her sisters and returned to Katavasis. The rest of the inheritance she received from her parents was distributed to the widows and orphans, and whatever remained she used to later build a church with great care that she dedicated to the Savior Christ. Her food was simple and brought to her by one of her sisters. 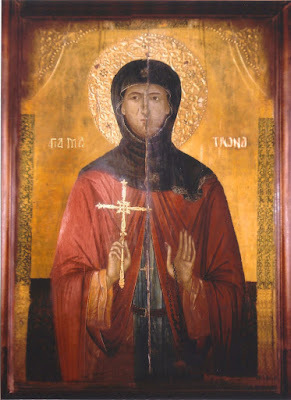 After three years she left Katavasis and went to the capital of the island, where there were many women's monasteries. Upon visiting the different monasteries, Maria found a small secluded one consisting of three nuns: a mother and her two daughters. The nuns, realizing her sincerity, immediately welcomed her into their home. At this point Maria received the monastic schema and her name was changed to Matrona. Matrona surpassed the other nuns in her devotion, spirituality, and understanding. Her sincerity convinced other girls to come to this monastery and lead the same type of life. The church itself was small, and so the abbess agreed with Matrona's plan to enlarge it and to build cells for the nuns. Any remaining farmland and personal belongings she had Matrona sold, and the built a public bath with the money received from this sale so that the poor and wayfarers could bathe. These baths were very common at this time. After this, the renovation of the church began. 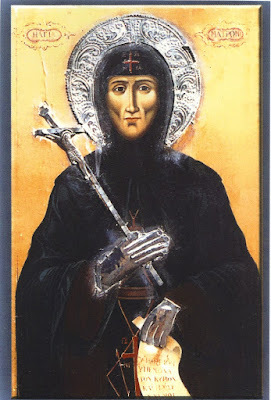 When the church was completed (with the help of Saint Artemios, to whom it was dedicated), the abbess of the monastery died. The nuns then elected Matrona as the new abbess. She showed charity to the poor, wept continuously out of love for God, acquired all the virtues and grew in her eros towards God. For this she was able to heal the sick by the grace of God, and even raise the dead. It is said that when Matrona entered the restored church, she found there a great treasure. This was brought about for one of two reasons: either as a temptation from the devil, or for God to show that Matrona disdained perishable and vain wealth. Thus, when she discovered this treasure, instead of feeling joy, the Saint prayed to God that it may disappear. And indeed, by a miracle the treasure turned to ash. After the Genoese conquered the island of Chios, they plundered the island and the monasteries, including the monastery of Matrona. When one of these foreigners attempted to attack a nun of the monastery in a lascivious manner, the Saint prayed for divine help, and the assailant was found dead. Having compassion towards this man, the Saint prayed for life to return to him, saying to him: "Why have you dared, O mindless man, to pursue this undertaking? Arise. And from henceforth do not undertake such mindless deeds." Having said this, life returned to him. This miracle became known to all, and even the foreigners, having heard of the miracle and received it in a devout manner, changed in their wild character and became calm towards the inhabitants of Chios, no longer bringing harm to anyone. After these events, Matrona dreamt of her own death. She suffered from an illness for seven days. In the seven days she advised the other nuns as a mother would advise her children. She received Holy Communion and reposed in peace, then buried in the monastery's church, in which she had spent the greater part of her life. Numerous miracles occurred after her death and till this day. Many people with all manner of afflictions come to the church and are cured through her intercessions. In the village of Katavasis, there was a church built to honor the place where Saint Matrona had first started her spiritual struggles. Later, a larger church was built and the smaller one was used as a cemetery chapel. 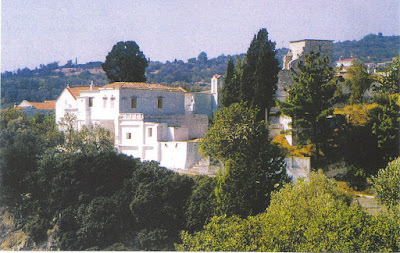 The Holy Monastery of Saint Matrona was built by the noble Roidis in 1470 near the village of Mesa Didima. He originally intended to build a summer villa; however, Saint Matrona appeared to him in a dream and instructed him to build the monastery instead. His sisters were the first two nuns to enter the monastery. The abbot of the monastery during the Turkish Occupation was Saint Nikephoros of Chios. Nikephoros wrote the 24 Hymns of Saint Matrona. Today, four nuns dwell in the monastery. 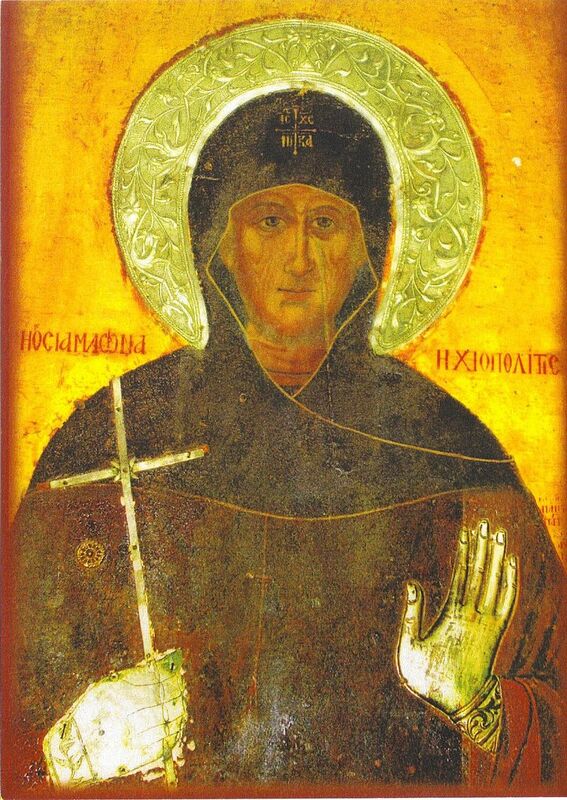 The Life and Service to Saint Matrona was composed by Metropolitan Neilos of Rhodes. It was found in a book from 1357, which indicated that she died sometime before this date, even though many sources indicate she died in 1462. 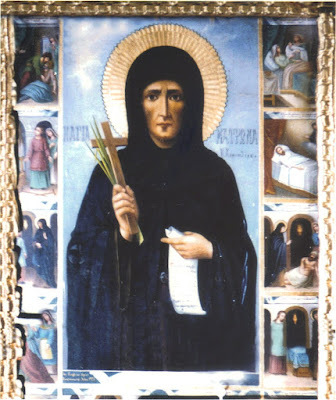 It should also be noted that since an abbess is called Kyra, till this day Saint Matrona is known to locals in Chios as Holy Kyra, and this is why it is also the name day of women named Kyratso and Kyrasia on her feast. The Church celebrates her memory on October 20, and the discovery of her skull on July 15. Following the steps of Christ, you left behind all the pleasures of the world, and imitated in the flesh the lifestyle of the angels. Wherefore with the gifts bestowed by the Spirit you brightened up your homeland, the island of Chios, O Maiden extolled by all. And therefore it cries out to you joyfully: Rejoice, O all-honorable Matrona. In no wise was your femininity, seen as a hindrance O Matrona, towards your super human struggles and contests, putting them to shame, by your great mind O God-bearer, bringing great gladness, to the female race by your victories, taking away the reproach of defeat. Having poured forth the sweat of asceticism, in Chios O Mother, as the stream of a spring, from which we draw from, blessed Matrona, the cleansing of the passions of our perishable soul. Having your revered icon, glorious Matrona, as a lasting tower, we flee to it in times of all manner of danger, and we are redeemed from all harm.